I'm assuming this LCD unit is a lot like all the others out there. It works, and If found the basic commands to clear the screen, position the cursor, and print text. I've also found commands lcd.cursor() and lcd.noCursor() that let me show/hide the cursor. Can somebody point me to docs on the full suite of commands commonly available for these LCD units in the Arduino Newliquidcrystal_1.3.5 library? Often in software development, the code is the documentation. The merits of this are debated ad nauseam elsewhere. As you have provided a link to the GitHub repository of the library you are using, you have all you need, though the provided utility/docs path doesn't fully document the I2C interface. The function prototype (that is, the function, its return type, and parameters, but without the actual code) is found in header files which usually have the .h suffix. Within this file, you can see that the class is defined with name LiquidCrystal_I2C and has multiple constructors, each with a different list of parameters. The particular class constructor used is the one that matches the count and type called in your declaration of the object of that class. LCD. The constructor does not initialize the LCD. This block shows the first 2 constructor options: With a uint8_t type that defines the I2C address of an I/O expansion module (which is what many "LCD backpacks" are -- that, or shift registers), and one with an I2C address, a backlight pin, and the polarity of the backlight. That last constructor is used to override the default pin mappings from the I/O Expander to the LCD. This is tricky -- what were the mappings based on? An I/O expander is basically a way to access multiple pins on an external chip through a single two-wire interface (I2C). How an LCD is connected depends on what pins of the I/O Expander are connected to which pins of the LCD. There is not a formal standard, though there may be convention. 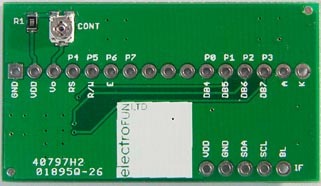 P0 is pin 0 of the I/O expander -- the top row are the I/O expander pins. Vo, RS, R/W, etc. are the LCD pins. This is the point where you have to find out if the I/O expander on your purchase has the same pinout as the product for which this library was written. This indicates that the I/O expander on your LCD does not have the same pin connections as that for which the library was written, which is why you had success only when remapping them in the constructor. All that to just re-state the hair-pulling you had to do! This library provides the same interface to applications as the LiquidCrystal library sourced by the Arduino SDK. It provides scrolling, blinking, enable/disable, etc.